A 5/2-way Namur valve has a standardized flange according to VDI/VDE 3845. 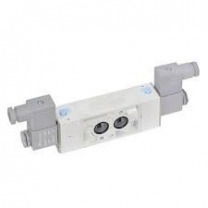 This way, the valve can be directly mounted onto an appliance, such as a pneumatic actuator. The valve can be mounted in two ways by rotating the valve 180 degrees. The two mounting positions offer the possibility to pressurize or de-pressurize the appliance when the solenoid valve is energized.